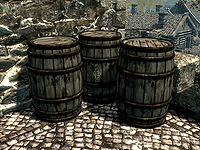 Thief caches are barrels that appear in various places around Tamriel as you progress in the Thieves Guild quest line. They often appear near other barrels, but can easily be distinguished from them by the Thieves' Cache shadowmark ( ) on their side. The first three appear in Riften after you first join the Thieves Guild. After that, three barrels appear in each of the appropriate cities as you complete the various reputation quests. The barrels contain significant loot and will respawn. An additional barrel is available with the Dragonborn add-on. In the northwest corner of the garden behind Honeyside. In the northwest corner on the walkway outside the second floor of Mistveil Keep Barracks. West of Valindor's House, across the canal. Beside a pillar down the stairs between Nepos's House and Understone Keep. At the base of the northernmost waterfall below Ghorza's smithy. Only the top is visible; the rest is submerged. Just off the pathway behind Vittoria Vici's House. Behind The Winking Skeever, to the north. Standing upright beside the other barrels next to the door to Erikur's House. In the farmyard next to the Gray-Mane's house. Beside the door to Sadri's Used Wares. In the alcove north of the door to Hjerim. In the basement of Glover Mallory's House at the end of the Paid in Full quest. The caches may not appear after completing the correct quests. This page was last modified on 6 May 2015, at 22:45.